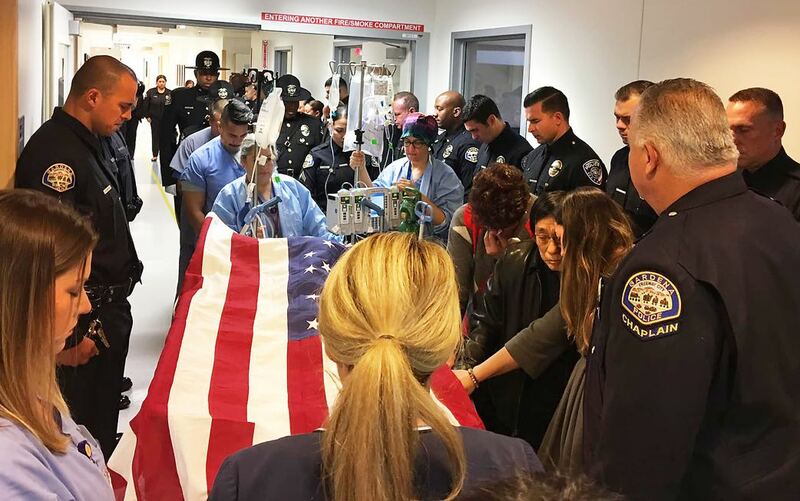 GARDENA — At noon on Tuesday, the body of Officer Toshio Hirai, 34, was moved in a procession from Harbor-UCLA Medical Center in Torrance to the Los Angeles County Coroner’s Office near Downtown Los Angeles. The night before, Gardena police gathered at Harbor-UCLA Medical Center to honor the officer as he became an organ donor. Funeral services will be held on Friday, Nov. 30, at Green Hills Mortuary and Memorial Chapel, 27501 S. Western Ave., Rancho Palos Verdes, said Gardena police Lt. Prendergast. Hirai was on his way to work when he collided with a vehicle about 7:50 a.m. on Nov. 14 at Western Avenue and 238th Street, according to police. He died the following day at Harbor-UCLA Medical Center, leaving behind a wife and 2-year-old son. Hirai was a 12-year veteran of the department and a member of its SWAT team. The driver of the other vehicle stopped at the scene and cooperated with investigators, according to the Los Angeles Police Department, which was investigating the collision. Neither alcohol nor drugs were suspected as factors in the crash, police said. Donations to assist the officer’s family can be made by visiting http://ow.ly/OKzH30mDACi. Prendergast said it is the only legitimate online donation site for the fallen officer, his wife Kristen and their son. Checks made payable to the Gardena Police Officers’ Association (GPOA) can be mailed to or dropped off at: Gardena Police Department, 1718 W. 162nd St., Gardena, CA 90247. All donations are tax-deductible.